Dutch draughtsman and painter. He was the son of Johannes Cats, a Dutch bookdealer who moved back to Amsterdam from Germany following the death of his second wife shortly after Jacobs birth. Jacob was trained as a bookbinder and as an engraver, first under Abraham Starre and later with Pieter Louw (d 1800). After further training with the pattern designer Gerard van Rossum (c. 1690-1772), he became a wallpaper painter in the Amsterdam factory of Jan Hendrik Troost van Groenendoelen, for whom he worked for three and a half years. Cats then established his own wallpaper factory, with financial assistance from his relative Willem Writs and from Jan de Bosch and Johann Goll van Franckenstein the elder. Cats was also a skilled amateur draughtsman, specializing in topographical views and landscapes, such as Two Shepherds Conversing before a Large Tree (Hamburg, Kunsthalle). He also made copies of famous paintings such as Rembrandt s Night Watch and Gerrit Dou s The Poultry-seller. Catss drawings are usually signed and dated and often inscribed and numbered on the verso. Those that are numbered are less finished, usually in black chalk alone or with some grey wash, and frequently correspond with highly finished versions in watercolour or pen and ink; the numbers could thus refer to sheets in a pattern or sample book from which potential clients could select subjects to be produced as independent works of art. Catss drawings were sometimes reproduced in prints. 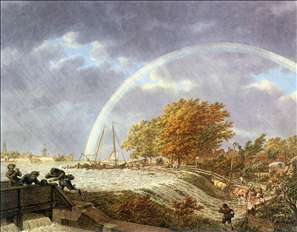 See more details about "Autumn Landscape with Rainbow"